Opening words and passing of the feather, Mishi. Heartfelt words by Hornbyites; lunch. Do not stand by my shell and weep. I am not there, I do not screep. I live on as part of mom; I am with her, I am not gone! We soar above the world, so high - together still, with her I fly. Do not stand by my shell and cry. I am not there, I did not die! Next year again upon this nest I shall lie beneath her breast. At last, my turn will come next spring, when I will test my little wing. Do not stand by my shell and grieve. I live on; in that, believe. getreel: (12:50) does any one know/remember when the eggs were laid? amazedbyeagles: (09:51) Monday Morning Event at Hornby! lookylo: (09:51) we are all a liittl OZ!! donnae: (21:11) I have dressed in my period widow’s dress for the occasion and have a vacant nest by me for dudley!! songbirdsing: (11:52) Did everyone sign the condolance book? basenjimom: (11:53) Dot? got your hat on? tigerlady105: (09:53) Hello Hornby Friends. It’s nice to see you all here for this special occasion. getreel: (12:52) does anyone know/remember when the eggs were laid? donnae: (21:13) ty bv, shouldn’t effect me too much as I am on it in the wee hours of the morning!!! bettehale: (12:54) Can I sit by you Opie? knitmaster36: (12:53) can I get an aisle seat or am I too late? momola: (09:53) OMG Hard to find an empty space in the pews here this am. sugarfree6996: (13:53) april29? ? ? ? ? ? ? ? ? ? ? dancinglady: (09:54) Good morning all….listen to that lovely music. Have they lit the candles yet? donnae: (21:13) first egg was Apr. 29th which I think was Dudley?? basenjimom: (11:54) BOB sits in his own pew!! knitmaster36: (12:54) in the back, bas? dancinglady: (09:54) so who is officially….officiating? donnae: (21:14) your right, boy I am losing it!! sunny-ala: (11:55) Standing room only now? boodle317: (11:55) was Mojo here knit? amazedbyeagles: (09:55) What a CROWD for Dudley!!! celas654: (12:55) Are there assigned seats or can we sit anywhere??? momola: (09:55) I brought EGG NOG! patience: (09:55) how long until he leaves the nest? Anybody? dancinglady: (09:55) awwww typos we’ll miss you! gzebear: (12:55) knitmaster, are you copying chat for Mojo? churchlady: (12:55) did I miss anything yet? Hi everyone…..
karleen: (09:56) Whew, glad I made it on time! allcotton: (12:56) I will try to post again. Providing I’m not kicked out again! allcotton: (12:56) Is it my breath?! getreel: (12:55) any body want to stand in the back with me? tigerlady105: (09:56) Hi Mishi, Opiek, Bette, Knit, Momola, Amaced BV, Only, NancyM, Sugar, Bette, Donnae, Boodle, Patience, Gze, Church, Getreal, Allcoton, Roxy, Basenji, Ducky, Celeste, Squirrel, and all the ships at sea. Hope I haven’t left anyone out. momola: (09:56) I’m so eggcited! amazedbyeagles: (09:56) wow, tiger, that was good! amazedbyeagles: (09:57) 107 names would take an hour to recite! roxymom: (12:57) Bye Dudley. We’ll be seeing you in all the old familiar places. amazedbyeagles: (09:57) dancing in the church??? behind the pews? amazedbyeagles: (09:58) Is the food ready? tigerlady105: (09:57) I think Bob said he couldn’t be here because he has to go to court. boodle317: (11:59) is ajl attending? amazedbyeagles: (09:58) pews in the garden…. roxymom: (12:59) I hope you’re enjoying this bob. tigerlady105: (09:59) Strewing rose petals on the aisle. basenjimom: (11:59) I can pull the hearse in again if you’d like. boodle317: (11:59) let us slow chat just a bit so that Mishy may begin? helinwa: (09:59) RIP Dudley. Can’t stay, but I’m donating 2 dozen deviled eggs. Later, peeps. knitmaster36: (12:59) mojo will get it for sure – in multiples! helinwa: (10:00) Hi all. RIP, Dudley, miss you. tigerlady105: (10:00) I made egg bread (challah). roxymom: (13:00) Who’s holding the wake? amazedbyeagles: (10:01) hi luv! We’re waiting for the officiator! donnae: (21:20) Booni in her lovely garden!!! tigerlady105: (10:00) The wake will be out on Grassy Point. auroradawn: (10:01) <<< and when did it get eatin? is there a hotspot? ajl: (12:01) Good morning friends. We are gathered together to remember our friend Dudley. donnae: (21:21) the service has begun!!! boodle317: (12:01) will mom’s tweet suffice for our music? ajl: (12:02) Please open a new browser so that you can participate in the music. amazedbyeagles: (10:02) oh dear, I feel a computer crash coming…. donnae: (21:22) wish I knew how, but I will hum a few tunes!! tigerlady105: (10:03) Allcotton, the chat is going fast. Did you see my questions about the collage? amazedbyeagles: (10:04) Very fitting, ajl! Lovely! ajl: (12:04) Talking feather to Mishi. momola: (10:05) Have some of my egg nog! lizardknight: (12:05) what is everyone crying about? sunny-ala: (12:05) COD in honor of Dudley’s absence? janeb: (14:05) Passing Kleenex Around To All You Eagleholics!!! great_bear: (12:06) Hello mom, dad, Phoenix, assortment of friends from near and far. We are here to remember Dudley. You may remember Dudley as Eggbert. Once it was confirmed that Eggbert was nothing but a DUD. I thought it was a good idea to rename Eggbert and call him Dudley, and Dudley was born, er, renamed *sniff*. Dudley was both a pin in the neck and a comfort To both Phoenix and dad, mom humoured them both. *hick* scuse me. Sit down in front, where did that *hick* olive go…slurp. Ooops, sorry for bumping into you, didn’t mean to break you or anything. A moment of silence please…….Woody, get down unless you have a few words to say and stop sniffing my glass……….thank you. tigerlady105: (10:06) Dudley was a wonderful companion and served his purpose well for his brother. tigerlady105: (10:07) Passing the talking feather to Donnae who just returned to us. lauren-aint-boren: (12:07) Dudly, even though Ididnt know it that long, or at all. I will always miss him. Mom ate him for a good reason, she was hungry. donnae: (21:27) Dudley, will never be gone, he will always be in our hearts!! ajl: (12:08) Donnae, would you choose a person to pass the talking feather to. abramsdaughter: (13:08) Love that song ajl. Bye Dudley. duckynana: (13:08) In the words of Mother Goose: “All the king’s horses and all the king’s men, couldn’t put Humpty-DUDLEY back together again”. nyeagleye: (13:08) So long my old friend Hope we get to laugh again So long my old friend Go on, show them what you’re made of Show them what you’re made of. gypsy22: (10:09) Dudley was a GOOD egg. He had a way about him I would call it smooth he was very very smooth Unfortunately he finally cracked under the pressure…:( He will be sadly missed by all! bayofundy: (14:09) to Dodley, Didn’t know you well, but the time I have spent with you was so special. I will think of you always,and think of you with kindness in my heart. Miss you Dudley. ajl: (12:10) There is the spot where he was laid, in cup so soft, in dappled shade. knitmaster36: (13:10) May I have the feather? tarvena: (10:10) Thank you Judy Collins, your song really brought it home for me. I’ll always remember how Phoenix loved Dudley. bayleegirl: (10:10) Dudley, egg shells to egg shells. We will never forget you!!!!! ajl: (12:10) This egg bread is delicious Only! boodle317: (12:10) RIP Dudley….you were a huge support to your brother….his wing….his pope’ nose, etc. You served your purpose well…We will miss you. donnae: (21:30) no eating now, service is on!!! Couldn’t put Dudley together again. ajl: (12:11) Donnae, could you pass the talking feather please? lauren-aint-boren: (12:11) is the service over? ? ? ? donnae: (21:31) I did to Sparkie!!! only_an_egg: (10:11) k joker running wild with the talking feather.. wait your turn!!! ajl: (12:11) Surely Dudley deserves more than eleven minutes? right-eyed: (13:11) What? What? Back the train up, only_an_egg! You said, “….the passing of dudly lizard?” What have I been missing, here. I told the florest that my funeral boquet was to be delivered to the funeral of Dudly the egg what was, but is no mo, no mo. janeb: (14:11) Dudley, May you rest in peace. I know in my heart that Echo will show you the way home!!!! lookylo: (10:12) Now he is but an egg-shell on the beach of life…. knitmaster36: (13:12) Gloris in Eggcelsis Deo! donnae: (21:32) Okay I will pass it to luv seeing as sparkie is too choked up to talk!! mishikeenhquay: (13:12) All of Nature has the wisdom to follow the Natural Laws. All of Nature knows how to live in harmony and use this wisdom in a good way, with exception of the human being. Often we misuse this wisdom. Wisdom always remains with those who use it in the proper way. Nature has used this wisdom well, so now we need to go to Her so we humans can relearn and change our lives. May we start doing this today, before it is too late. knitmaster36: (13:12) Shall we read from Egglesiastes? churchlady: (13:13) knit you are pretty funny! ajl: (12:13) Greetings luv. Thank you for your words. karleen: (10:13) What a wonderful service. 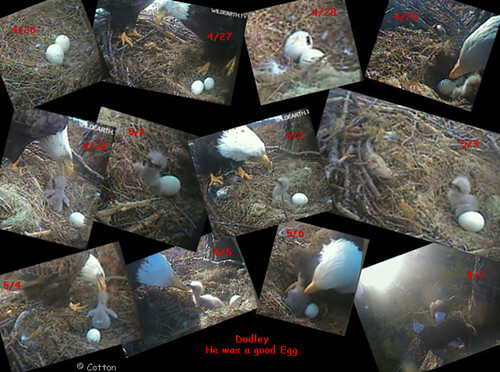 gzebear: (13:14) Eulogy for Dudley:Dudley was good egg. And that which we call Dudley was very much alive, has always been alive, and still lives on – not an embryo, not an eaglet, but still a joyous mass of Life. Who knows whence came Dudley or, after Mom’s crop, where the journey leads? Yet Dudley is too a part of each of us, the idea that didn’t hatch but stayed around and served a purpose till one day splat, and gone. We clean up the mess, move on, and it fed us nonetheless. So I say … Long Live Dudley. Long Remember Dudley. ajl: (12:14) Talking feather to allcotton please. duckynana: (13:13) may i have the feather back, i forgot something! right-eyed: (13:14) You people have got to slow down, did I come for the funeral of an egg that had a short….too short a life, or some dopey posseum skull! ? ? ? ? ? lauren-aint-boren: (12:14) can i go? ajl: (12:15) Mishi, could you pass the talking feather. allcotton: (13:15) spacing didn’t come through! lauren-aint-boren: (12:16) Why is the feather going to me? ajl: (12:16) Maybe not the feather, but…. eviemae: (12:16) lol..lauren say something about dudley…. netnanny: (14:17) this is absolutely breaking me up!!! boodle317: (12:17) did i hear someone brought egg bread? knitmaster36: (13:17) a cracking good service! donnae: (21:37) I hid the egg rolls for Dad!! nyeagleye: (13:17) there is a big Ham in the nest! gzebear: (13:17) I want coddled egg and salmon. donnae: (21:37) and the salmon salad from Ostrich!! ajl: (12:17) Yes mishi. I ask for the feather and for chat to stop. knitmaster36: (13:18) dud was a coddled egg! only_an-egg, we’re all on the same page. I’ll l catch up! mishikeenhquay: (13:18) FEATHER PASSED TO AJL…..STOP CHAT!!! knitmaster36: (13:18) Who gets thwe flowers? ajl: (12:18) I shall conclude the service to honour Dudley. I am not there, I do not screep. pbsmith: (12:18) I see they have brought in a pine cone to replace Dudley as Phoenix’s buddy. lauren-aint-boren: (12:19) BYE I GOT TO GET! SEE YOU ALL TONIGHT! I am with her, I am not gone! Together still, with her I fly. dougcarrick: (10:19) All the eagles of Hornby Island appreciate this memorial service for Dudley as do the eaglets and eggs, successful or otherwise. Thank you on behalf or all of us. Do not stand by my shell and cry. I shall lie beneath her breast. When I will test my little wing. I live on; in that, believe. janeb: (14:20) DOUG…Echo Will Show Dudley The Way Home!!! Triton: (12:20) Beautiful all of you!! ajl: (12:20) I hold the feather. Please be still. tigerlady105: (10:20) I made egg bread (challah) Boodle. Here, please have some. dougcarrick: (10:21) I left my garden at 10 am in order to take in all of the memorial service. It was great. donnae: (21:40) shhhhh, ajl is not finished!!! boonibarb: (10:21) That was BEAUTIFUL ajl! ajl: (12:21) Pass the eggrolls. plahti: (12:21) So where is the egg, I havve been gone and mostly a lurker. nyeagleye: (13:21) So long my old friendHope we get to laugh againSo long my old friendGo on, show them what you're made ofShow them what you're made of. momola: (10:21) Change is the constant, the signal for rebirth, the egg of the phoenix. great_bear: (12:21) who took my egg salad sandwich? donnae: (21:41) Amen and we will always remember Dudley!!! tarvena: (10:22) Oh this music brings it all home. donnae: (21:42) Booni glad you made it!! ajfe: (10:22) thanks for the pictures all cotton - hard to believe Phoe was ever that small! plahti: (12:22) i have been mostly lurking and out of town for a week, where is the egg? donnae: (21:42) post those pics of Dudley again for Ajl, Doug and Booni!!! panache: (11:23) Good Grief charlie brown !! mishikeenhquay: (13:23) would anyone like some egg salad sandwiches? celas654: (13:23) Wonderful AJL. You did good! allcotton: (13:23) Good devilled eggs! saladd42: (13:23) i have no sound. anyone know how to get sound? great_bear: (12:23) ....passes champagne to celebrate life..
ajl: (12:24) Oh allcotton, what beautiful pictures of dudley. He was a beautiful egg. neohio: (13:24) hello all. having an over-easy day here. mishikeenhquay: (13:24) ajl....thank you ...migweetch!!!! plahti: (12:24) when did the egg break> and when did it get eatin? is there a hotspot? duckynana: (13:23) Anybody want to do the "chicken-dance" now? celas654: (13:24) Thanks Eagle friends. This was very touching and now it is back to the ironing. ajl: (12:25) It could go in the 'only on hornby' section, with the eulogies and music. tigerlady105: (10:25) Dudley would have been honored by your presence, Doug. boodle317: (12:26) To Ma and Pa HOrnby.....for always doing what's just and right. plahti: (12:26) when did the egg break> and when did it get eatin? is there a hotspot? sidneygal: (10:26) my glass too! donnae: (21:46) may we have many more great memories too!! boodle317: (12:26) Geez AJL....now I'm bawling! lynxcat: (13:27) you guys are incredible...thank you! fitchies: (12:27) I bawled when Mom laid the eggs! duckynana: (13:26) great service....now we can all move on! allcotton: (13:27) I think it's rather fitting that the nest look very nearly empty this morning! basenjimom: (12:27) Thanks to all that made this possible. ajl: (12:28) We love you Mom, Dad, Phoenix, Hope, Echo and all who have come before and will again. Thank you for sharing your lives, your wisdom, your truth. tigerlady105: (10:28) Giving a rose to each person here, and Dookie, too. ajl: (12:28) We love you Doug and Sheila. Thank you for sharing your dreams, your joy, your peace with the world. dancinglady: (10:29) Double ditto on that! donnae: (21:48) I'll second that one ajl!!! ajl: (12:29) We love you, Hornby friends. Thank you for caring, for sharing, for taking the message forward. dougcarrick: (10:30) Mom eagle is perched on the stump looking down on Phoenix and dad is in the Peters's Tree looking for fish. The tide is getting down and Dinner Rock is just emerging from the water. donnae: (21:50) I also want to thank all for your caring and kind words!!! You are all the greatest!!!!!! ajl: (12:30) Thank you Doug. churchlady: (13:30) thanks all for sharing! eviemae: (12:31) lunch time…. sorry dudley..
donnae: (21:51) how am I going to work today with these red eyes and tears!!!! MDBenson: (13:33) HELLO ALL YOU EAGLEHOLICS OF THE ‘I.E.A.’ AND HOW ARE WE DOING TODAY? ajl: (12:32) Mom calling on the stump, dad from the shore. neohio: (13:32) great bear – how will I ever scramble again? Only sunny side up for me now. curlygram: (12:32) apparently she died young? fitchies: (12:33) where is Bob? duckynana: (13:33) NE was put back in the nest? only_an_egg: (10:34) yes boodle but still…. tigerlady105: (10:34) Doug will replay the video at 7 PM nest time this evening. MDBenson: (13:35) SO, WHO ATE THE EGG? mishikeenhquay: (13:35) take your meds!!! plahti: (12:35) is there a hot spot where dad crushes it and mom eats it? boodle317: (12:35) thank you mishi…I knew something was missing! meldy: (07:36) Good Morning everyone! ajl: (12:35) It is Mom’s role, to take back into herself what she gave. plahti: (12:35) i cannot find it. donnae: (21:55) well put ajl!!! auroradawn: (10:35) friday 9:35 ish? knitmaster36: (13:35) That was wonderful, all – been making sure I got the chat saved and I did – will compress it some and it will be available before too long if anyone wants it! allcotton: (13:35) ajl, beautiful Eva Cassidy! ajl: (12:36) Yay Knit! There were requests for that. ajl: (12:36) Yes mishi, well put. duckynana: (13:35) Oh yes, please knit! ajl: (12:36) Hi opie; so glad you could attend the tail end. katbro: (11:37) hello everyone, is it a nice day there? tigerlady105: (10:36) BBS It was beautiful. birdvoyer: (13:37) bbl…back to work. Very nice everyone! ajl: (12:37) Hello kat and everyone coming in. donnae: (21:57) It is a beautiful day!!!! aliemae: (13:37) ok can’t seems to find dougs movie did he play it last night? boodle317: (12:38) phoenix…show yourself…we need you! ostrich: (13:38) ajl, did you see the posting about Solo branching? meldy: (07:39) where is phoe? duckynana: (13:38) what a great support group! donnae: (21:58) hi my handsome little man!!! mishikeenhquay: (13:39) *raising glass….too PHOENIX…. donnae: (21:59) bye luv!!! have fun!!!! donnae: (21:59) here here mishi!!! boodle317: (12:39) taking mouse arrow and giving Phoe a head scratch. allcotton: (13:39) Thanks, all. Fitting sendoff for Dudley. Latah! donnae: (21:59) Hornby next stop luv!!!! allcotton: (13:40) Let the Circle . . . be unbroken . . .
meldy: (07:41) what happen to the last egg? (12:26) I have a last, personal message to the Eagles of Hornby Island. (12:28) We love you Mom, Dad, Phoenix, Hope, Echo and all who have come before and will again. Thank you for sharing your lives, your wisdom, your truth.